Jennifer Woods at Rolling Stone offers a piece on film director Michael Mann's crime film Heat. Michael Mann has been a driving creative force behind plenty of groundbreaking cops-and-robbers tales over the past 40 years, from TV’s "MTV cops" show Miami Vice to this year's bleeding-edge cybercrime thriller Blackhat. And while the 72-year-old writer/producer/director has done his share of tense true-story recreations and tough-guy classics, it's a certain steely crime drama starring two Seventies-cinema icons for which he might be best known. 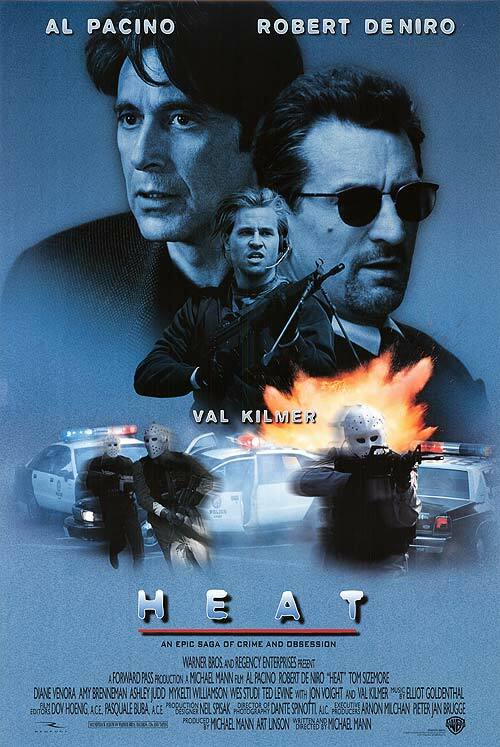 Released 20 years ago today, Heat originated from the story of an obsessive detective's quest to take down a disciplined career criminal in the early 1980s, based on a real-life encounter that Mann's friend, Chicago detective Charlie Adamson, had with an ex-Alcatraz inmate he was trailing (and eventually killed). The filmmaker started writing a script about these two men on the opposite sides of the law in the early 1980s, but claims that something was not working with the structure, and eventually put it aside. "When something's not ready, it's like not ready," he says. ... By the way, this elite major crime unit that Charlie was in — one of the sergeants in that crew was Dennis Farina. I recruited him to be in Thief (1981), and because of that he decided he wanted a career as an actor because, as he said, he'd be known as "Dennis, the Dream to Work With." That's why people would hire him, he thought. Which was probably true … .